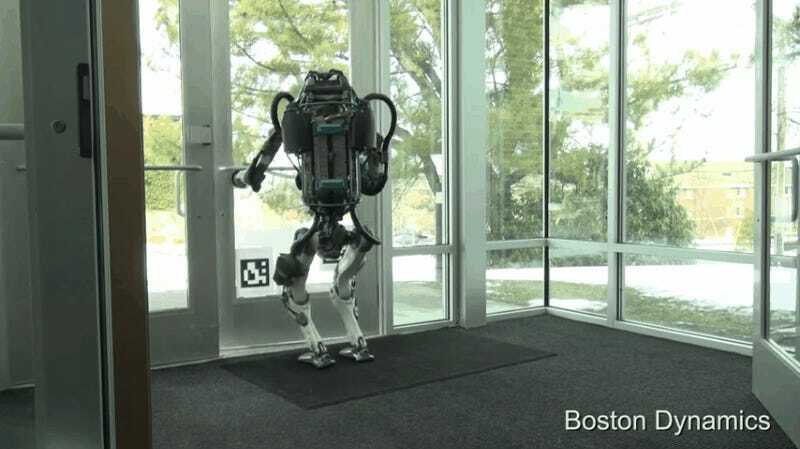 Boston Dynamics has a new video showing off the latest version of Atlas—the badass humanoid robot. And it’s pretty incredible. The most striking thing about this new version is the amazing balance Atlas achieves. 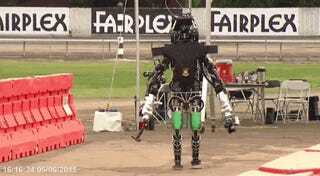 I’ve never seen a humanoid robot with this kind of agility. 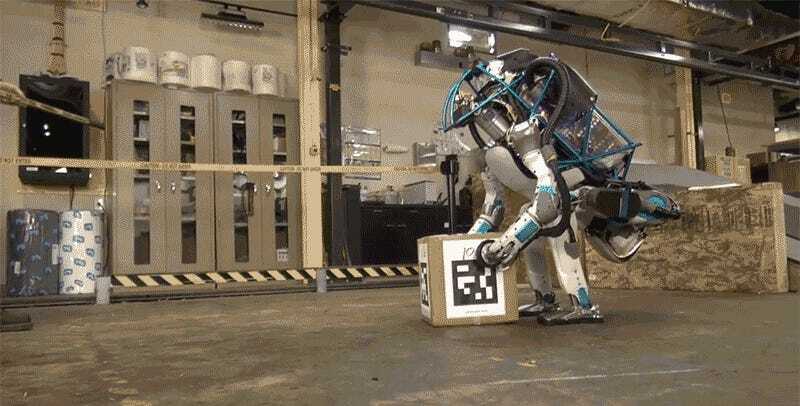 This version of Atlas can not only walk over rough terrain, but he can squat and pick up boxes. 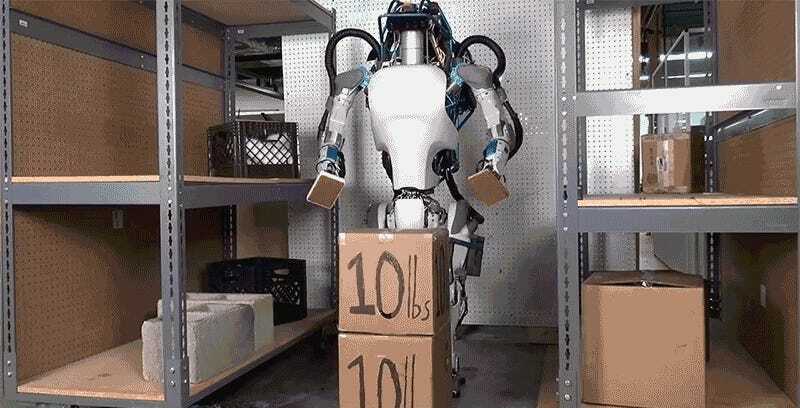 You can even push Atlas violently with a hockey stick and he’ll maintain his balance. And his most incredible accomplishment? He can stand up after falling down. When I was in Pomona, California for the DARPA Robotics Challenge this past summer one of the most difficult things that all the competing teams faced was simply keeping their robots upright. 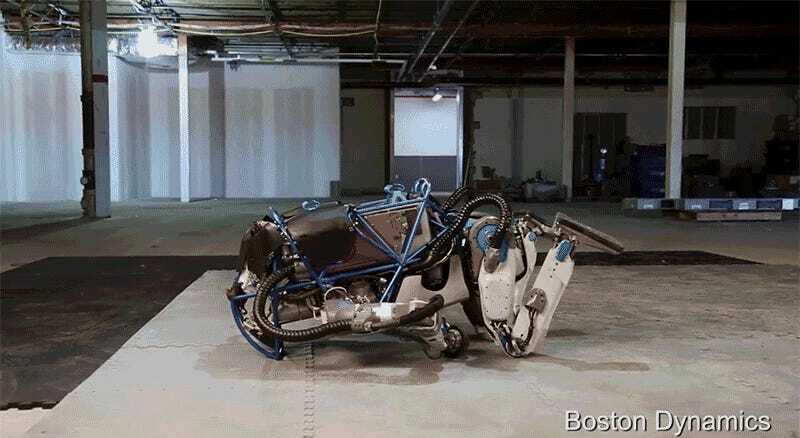 Remember all those funny gifs or robots awkwardly falling down? They couldn’t pick themselves back up. Many teams used the Atlas body—with their own software and alterations—and whenever an Atlas version fell over, the team would have to reset and start the robot from the beginning of the course. A new version of Atlas, designed to operate outdoors and inside buildings. It is electrically powered and hydraulically actuated. It uses sensors in its body and legs to balance and LIDAR and stereo sensors in its head to avoid obstacles, assess the terrain and help with navigation. This version of Atlas is about 5' 9" tall (about a head shorter than the DRC Atlas) and weighs 180 lbs. I just hope that future history books don’t refer to that violent hockey stick push as the start of the robot revolution. Update, 10:17pm: Remember when the raptors learned how to open doors in Jurassic Park?